Prince was gifted as a singer, songwriter and a with a multi-instrumentalist ability. He was able to hear and create what most can not. This is something you have to be born with. A talent like Prince’s is rare and obviously captivated generations of fans and the highest respect from fellow musicians. 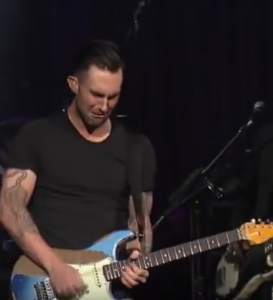 Here in the below video superstar Adam Levine (band Maroon 5 and The Voice TV show) gives his respects to “Prince” at The Howard Stern Birthday Bash by playing on the guitar and singing one of Prince’s world wide music hits “Purple Rain”. He is joined on stage by Patrick Monahan (lead singer of the band Train).